PUTRAJAYA, 6 November 2014 – Malaysia is ranked 8th in the world for diabetes with 2.1 million cases according to the latest survey for 2011. Lecturer and Consultant Endocrinologist at The National University of Malaysia (UKM) Hospital Prof Dr Norlaila bt Mustafa said China leads the list with 92.3 million cases of diabetes followed by Indonesia. Speaking at the 2014 Putrajaya LA21 Health Forum and Closing Ceremony of Slim Shape Programme here today, Prof Norlaila explained the causes of diabetes and its treatment saying that a person dies from diabetes every six seconds in the world. The programme is a joint effort between the Putrajaya Corporation (PPJ) and the Faculty of Health Sciences of UKM. Besides diabetes, she also spoke on heart disease, a major cause of death in this country as well as those at risk, saying that post-menopausal women have twice the risk of men to be attacked. The attacks also normally occur between four to ten in the morning. About 50 percent of patients will die after a year if no preventive measures are taken. 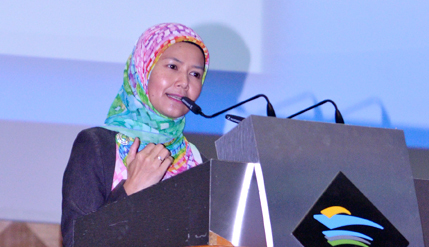 Although dangerous, the disease is preventable and can be treated, Prof Norlaila said. A nutritionist, Lydianis Bahari speaking at another forum stressed the need for healthy eating habits saying family support is important in ensuring a healthy diet and nutrition. There is need for proper eating schedules and meal preparations in a household to help prevent obesity, she said. Senior Vice President (Corporate Services), Putrajaya Corp Datuk Muhammad Nafis bin Ishak officiated the closing ceremony of the programme. Also present were Prof Dr Imran Ho Abdullah, Deputy Vice-Chancellor (Industry and Community Relations). The closing ceremony was attended by representatives of the Residents’ Association, the LA21 Putrajaya Committee, Slim Shape programme participants, government agencies in Putrajaya and representatives of UKM and other agencies. In addition to the health talks, free health screenings were given while a health fair was also held.